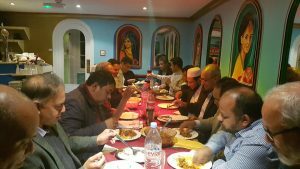 A networking meeting was held on Monday 12th November 7.30pm at the Monsoon Restaurant in Brick Lane London chaired by Alhaj Monir Khan and attended by S.I Khan, Azad Khan, MD Nanu Miah, Enus Ali Somir, Kodor Uddin, Habibur Rahman, Monir Ali, Aklaqur Rahman, Motosir Ali, Faruk Ali, Kamal Uddin, Sirajul Islam, Rashidul Islam, Nurul Islam, Rahmot Ali and Shamsuddin Shams. To continue focus on disabled people in the Biswanath area as we have already been supporting many people in the Upozila. All members are requested to contribute 10% of their Zakath before Ramadan. It was also decided that we must have a coordinating team to oversee the event. The event co-ordinating team consist’ s of Monir Ali, Kodor Uddin, Habibur Rahman, Aklaqur Rahman, Motosir Ali Faruk and Rahmot Ali and will be overlooked by the Chairman, Secretary and Treasurer. The next coordination meeting is planned on 3rd December and Kodor Uddin has been tasked to identify a suitable venue. All members are asked to contribute £100 towards the event where possible and a significant amount was committed by the Secretary, Chairman and Education Secretary. It was decided that a new magazine to be launched during that event with advertising and one member, Nurul Islam already committed one-page advertisement. The members suggested to look at registration of the organisation as charity and the secretary stated that he is already working towards that plan. Members agreed to take on board the primary schools project and give long term consideration to midwifery training but supporting the Disabled is considered above all projects. Production of the Biswanath 8UK book was highly regarded by all the members attending and Sundar Ali’s effort as an editor was highly praised along with Azad Khan and S.I. Khan for providing support. Four new people attended the event and showed interest in joining the organisation. The organisation continues to attract new members because of all the ongoing activities in Biswanath Upozila and it is important we continue to support new projects.